After our life-changing stint in the magical Maldives, we were rested, relaxed and drunk in love – perhaps, a bit too chilled out as we hadn’t prepared much at all for the final stop of our yearlong journey. Arriving to Sri Lanka, the former British crown colony whose name in Tamil means “that which glitters,” we now know had we done proper research that we could have applied for our visas in advance, avoiding the long, late-night lines at the airport immigration counter (okay, one mistake in 12 months!). We eventually obtained our entry visas and made our way in the dark of night through the deserted highways of Colombo, the island nation’s capital and largest city, to our hotel, only to learn of a national rail strike that would likely impact our scenic train journey planned for early the next morning. With only a few hours to sleep before our supposed departure, we were equal parts annoyed (we hadn’t gotten any warnings from the travel company that sold us our train tickets) and relieved at the prospect of sleeping in. When our pre-dawn alarms sounded, we discovered that the strike was still in full force, meaning we would need to take a local bus to Kandy, located in the country's Central Province. Luckily, buses departed once an hour, allowing us to roll back over for a few more hours of shut eye. Glad for the mellow morning, we walked the short distance from our hotel to Fort, the city’s historic central business district, for coffee and breakfast, enamored by the area’s mix of heritage architecture – large porticos and white-washed buildings with broad promenades that were tidy and clean, a departure from our experience in Sri Lanka's sprawling neighbor to the north, India. Afterward, we nearly fell into an old Colombo tourist trap: local man pretends to be visiting from Dubai, letting us in on a secret gem market that's part of an important holy festival at a nearby ancient temple. Starting now! Hurry! Great deals! No thanks. Bye-bye! After a near year of traveling, we were now more comfortable with the uncertainty of travel complications (and wary of would-be hawkers), and so with bags strapped to our backs, we left our hotel for the city's bus station with only a hope and a prayer. Luckily, at the station, we were ushered onto an air-conditioned bus for a reasonable five-dollar ride to Kandy. Maybe not exactly how we expected go, but nonetheless, we were on our way! Four hours and a couple of podcasts later, we arrived in the jammed, grubby streets of busy Kandy, proving that we were still in the developing world. Starving, we dropped our bags at our central hotel and headed to Buono, a tiny café with a charity mission to support local children through its proceeds. After fueling up on veggie burgers and avo toast (OK, so Kandy wasn’t all that emerging! ), we made our way to the Temple of the Sacred Tooth Relic, the apparent resting place of a Buddha bicuspid. As the sun sat, the handsome temple lit up and the meditative sounds of chanting monks sounded across the grounds, and we made our way over the moat and into the two-story shrine for an evening ceremony. BOOM-da-BOOM. BOOM-da-BOOM. The drumming began as a singular horn called out and devotees and tourists lined up along a twisted staircase, angling for a glimpse of the gilded, gemstone covered casket that houses the scared relic. Monks led prayers, swung incense, placed offerings and generally, tried to crowd control the Buddhist pilgrims who had shed their customarily soft spirit of serenity as they shoved their way into the shrine’s small viewing area. 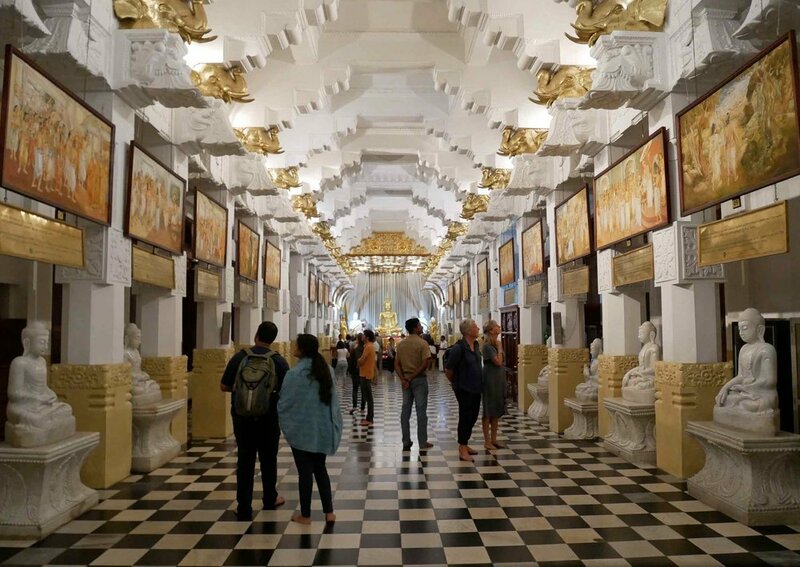 We quickly left our prayers and offerings behind as we moved into other sacred rooms and galleries, hung with historic paintings that told the story of Lord Buddha’s life. Here (as well as at the other temples and shrines we visited over the past year), the irony was not lost on us that this man who left his royal castle to better understand the world ended up enshrined in gold all over again. Statue of Lord Buddha in Kandy's Temple of the Sacred Tooth Relic (Dec 13). Hall with historic paintings depicting the life of Lord Buddha. Shrine where the Sacred Tooth Relic is displayed and honored by devotees. 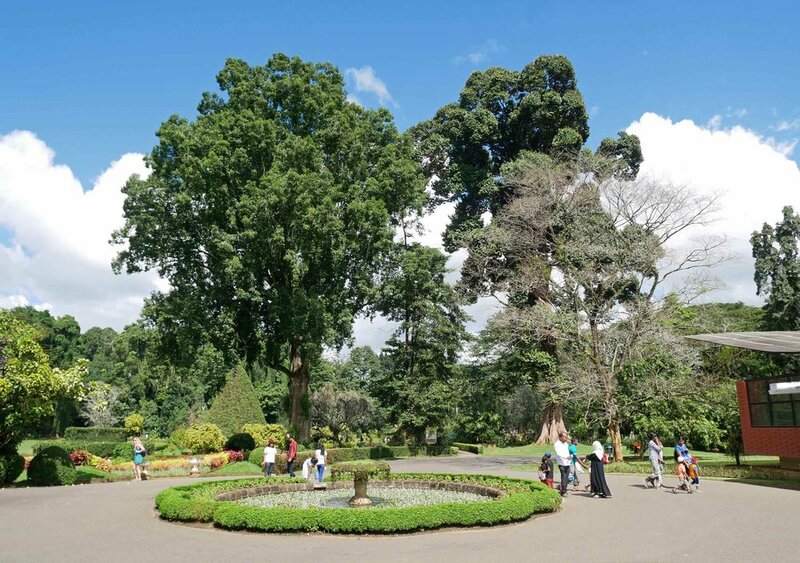 A stunning day to visit the Royal Botanic Gardens in Kandy (Dec 14). We were particularly curious of the many Cannon Ball Trees, one of which was planted by King Edward VII, son of Queen Victoria. Martin rooting himself in the beautiful nature here in the park – his happy place is anywhere with trees. Taking in the sunshine at the picturesque Bogambara Lake, which sits at the edge of Kandy next to the Temple of the Sacred Tooth Relic. 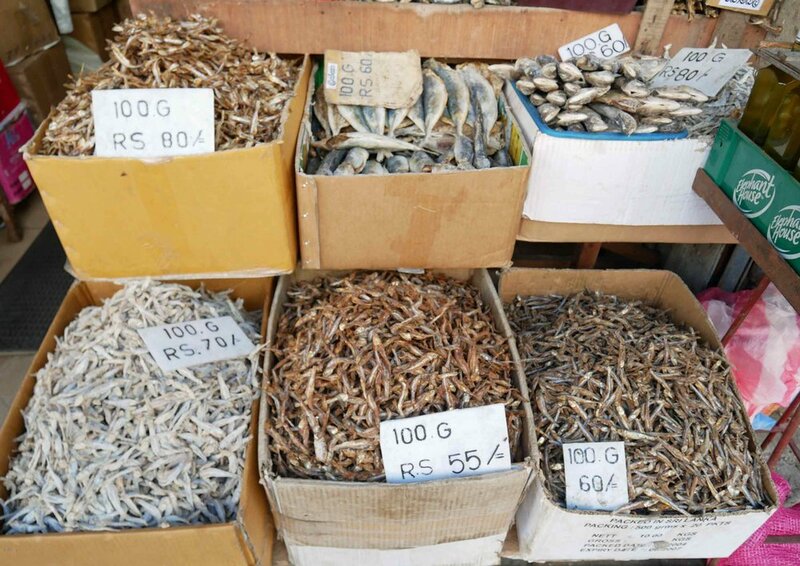 Ever curious of what’s for sale at the local markets, vendors here are offering sun-dried fish to flavor local curries. Our last adventure in Kandy was to mount the climb to the Giant Buddha statue overlooking the former capital – we made it just before the evening rain! 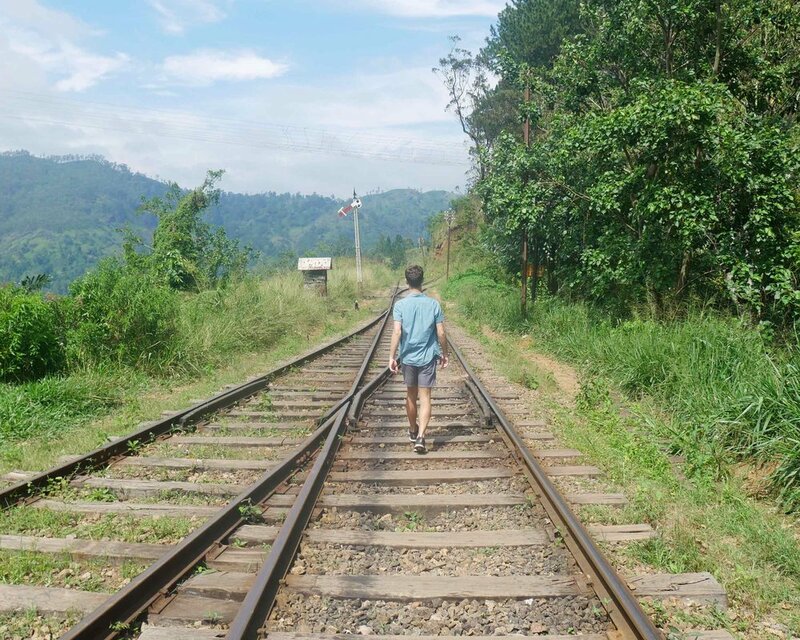 Our first Sri Lankan rail journey embarked from the charming Art Deco Kandy Railway station (Dec 15). The next day, we took a tuk-tuk some 12 kilometres to the city’s famed Royal Botanic Gardens, admiring the well-manicured park dotted with giant banyan trees, towering palms and peculiar yet stunning native plants and flowers. One section included memorial trees from colonial times, including a cannonball tree (!) planted in 1875 by King Edward VII, son of Queen Victoria, during his famous tour of the subcontinent. After revisiting Buono Café for another scrumptious lunch, we cooled off and rested at the hotel before making the climb to the oversized Buddha statue that watches over the city. Some 25 metres (80 ft) tall, the all-white monument sits on top of Bahirava Kanda, meaning “devil’s hill” in Sinhalese, offering panoramic views of Kandy, the last capital of the Sri Lankan kings. As we planned to head to our next destination, the mountain town of Ella, we kept our fingers crossed that the rail strike would come to an end so that we could travel via what has been deemed “one of the world’s most beautiful train journeys.” The next morning, not only were the trains up and running but also ours was essentially on time (a short delay allowed us to have iced Americanos from Buono delivered right to the station – we’re liking Kandy more and more!). 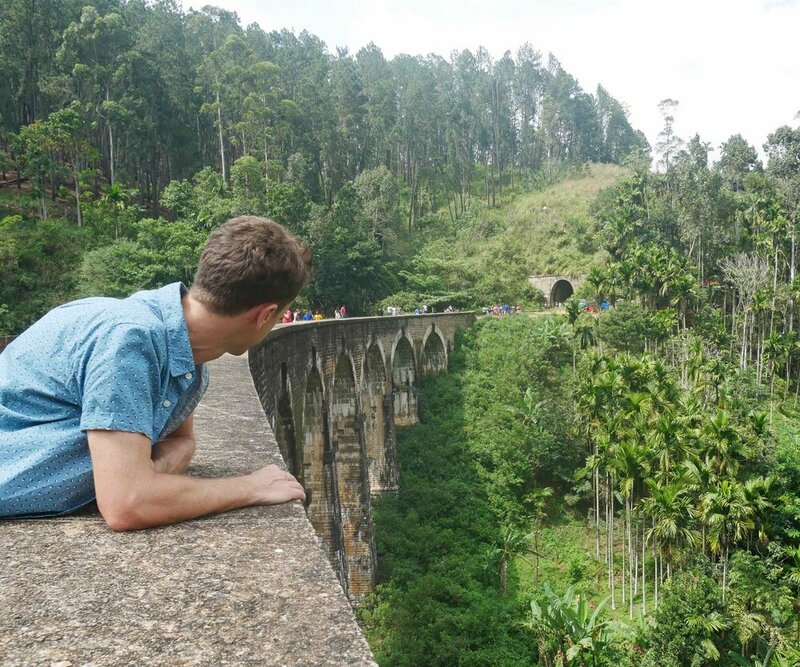 As we made our way through the hill country of Sri Lanka, the train meandered along verdant tea plantations, past roaring waterfalls and beside forests of gum trees, a total treat for train enthusiasts and certainly, one of the best train journeys we'd ever taken. As we rocked gently along the tracks, our faces (and cameras) were glued to the car's open-air windows. (Pro tip: For getting the best shots, the more exposed second class is preferable to the glassed-in windows of air-conditioned first.) 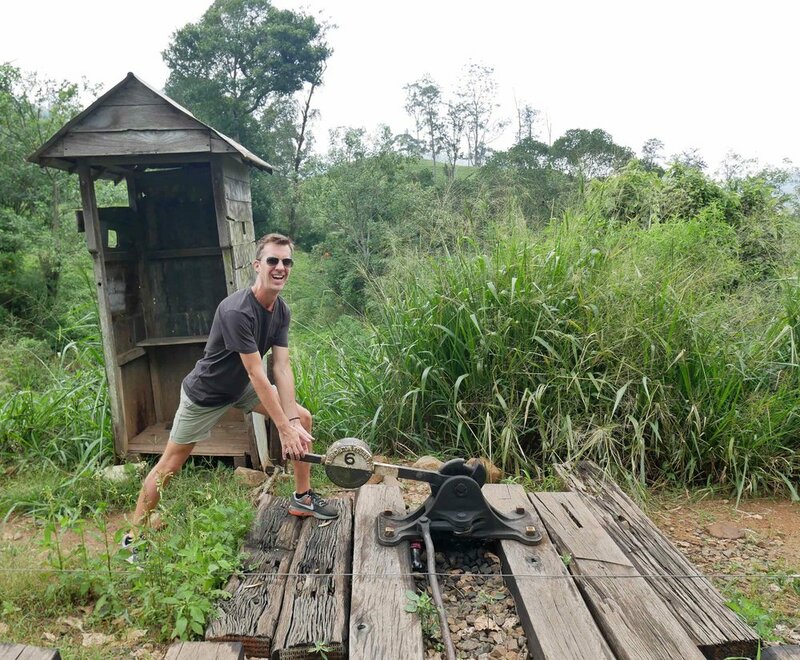 The cool, fresh hilltop air rushed into our train car as we craned our necks to peer across deep ravines of lush vegetation and to take in the sweeping valleys of terraced tea fields. The train climbed higher and higher, bending around itself as we passed through long mountain tunnels, and the weather suddenly shifted, forcing us to slam our windows shut to keep out the cold rain and fog, which to our delight created a dream-like scene. Several hours later, the air had cleared and warmed again and dusk had begun to fall as we came to a stop at the quaint Ella town train station. We took a short tuk-tuk ride up and over the railroad to our charming guesthouse on the outskirts of town (to which, without bags, was a quick and easy walk – but hey! We'd had a year of carrying these things on our backs!). 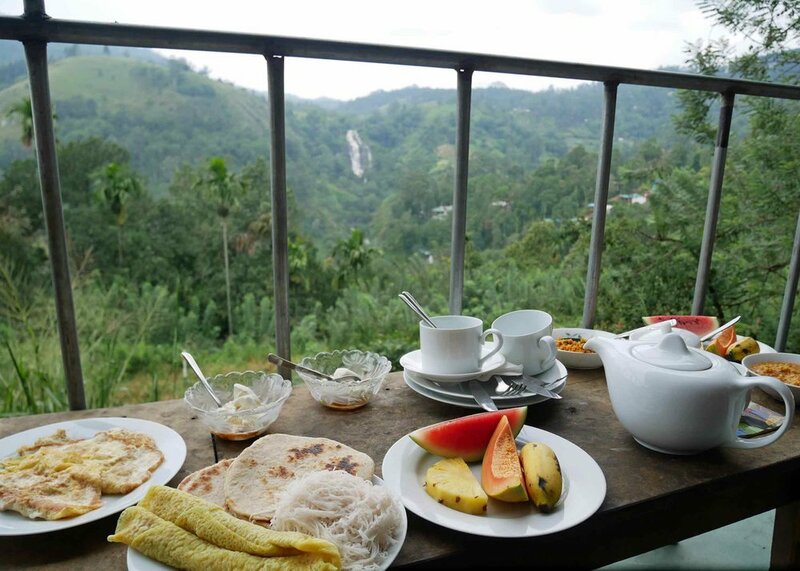 As the owner showed us our room, our jaws dropped as we took in the sweeping views of Little Adam’s Peak and Ella Rock, complete with picturesque waterfall, which we could faintly hear roaring from our balcony. From the open terrace, we soaked up the early morning sun as it made its way over the hills as our hosts - a young Sri Lankan family - graciously served a traditional breakfast, including a mix of egg hoppers, chapatti, dahl, fresh fruit and coconut roti, served with tangy buffalo curd and honey. All aboard! The train journey from Kandy to Ella was truly spectacular, taking us through lush forest, tea plantations and more (Dec 15). 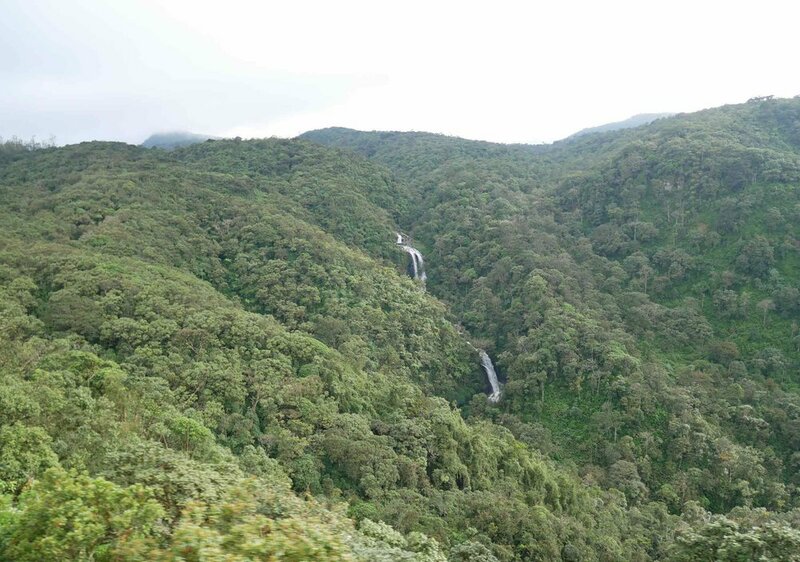 Waterfalls flowed a-plenty in this lush, verdant land. Trey took a peek out the window for some fresh, hill country air! This guy had the right idea with his wool cap – it got quite a bit chillier as we climbed in elevation. The misty air along the way added a surreal element to the train journey. Our Ella guesthouse absolutely spoiled us with these spectacular views and breakfast served daily on our private terrace (Dec 16). You can’t beat the views from here at Village View Homestay in Ella! Trey 'training' on the Ella tracks (Dec 17). Nine Arches Bridge is a popular place to view trains passing by – we had just missed it! Taking the shortcut via the train tracks, which led right into town from our guesthouse. Ella is very laidback, and our days consisted of visiting a site or two and otherwise, eating delicious Sri Lankan food, drinking tea (all locally produced, of course) and walking the rails (a la one of Martin's favorite flicks, Stand by Me). There was so much to do in the area; it's no wonder Ella is becoming a ‘must-stop’ on the tourist trail. And since we were still a bit shocked from our arduous trek in the Himalayas, we skipped a few of the outstanding trails here, but we loved the (flat) walk to the famed Nine Arches Bridge and our insightful tours of the various tea plantations. Despite being tea fans ourselves, we realized we had a lot to learn about this sanative drink as we were shown around Uva Halpewatte Tea Factory, which specializes in black tea. For instance, we were taught that all tea originates from the leaves of the small evergreen shrub, Camellia Sinensis, yet the processing (mostly oxygenation and fermentation) determines whether it is labeled white, green or black. As we walked the factory floor (sadly, no photos allowed), we were shown the many steps to producing various depths of black tea, and then we stood transfixed as we watched local women sweep and mix the fermented and dried leaves on a large concrete block, ensuring the perfect blend before bagging for auction. Our passionate guide reminded us of the many health benefits of tea, rich in antioxidants that repair DNA damage and fight cancer, which is why, he told us, he drinks as many as eight cups a day! With bags of factory-fresh tea in hand, we paused for a quick photo shoot in the fields and then were on to the finer, more polished Newburgh Estate, specializing in organic, fair-trade green tea. The grassy aroma we inhaled throughout the quick tour had us ready for a perfectly brewed 'cuppa' before making more bulk tea purchases, which we couldn't wait to sip from our balcony as the sun sat across the valley beyond. Women harvesting tea at the plantations around Ella (Dec 18). A man by the side of the road sorted tomatoes, which were harvested in the fertile valleys of Ella. Martin got lost amongst the tea bushes surrounding this solid white Buddhist stupa. Trey thought this leaf looked ready for pickin’! Heaven! Green tea in every shade! While in Ella we visited two tea factories (no photos allowed!) – black tea at Uva Halpewatte and this Green tea factory at Newburgh. We may have had a few cups of tea at this point in the journey! The picturesque tea fields of Sri Lanka are not to be missed! We couldn’t stop checking out the tea shrubs! As we left Ella, we got an up close view of Ravena Falls, the waterfall we had enjoyed from the balcony of our guesthouse (Dec 19). Our next stop in Sri Lanka brought us to one of the more endearing aspects of the small island nation – the rich animal life, which we surveyed within Udawalawe National Park. Home to the highest concentration of Sri Lankan elephants, an endangered subspecies of the Asian elephant, as well as Sri Lankan leopards, sloth bears, wild deer and boar, water buffalo and countless species of birds, including several birds of prey, we were grateful to embark on our second safari of the year (third, after our trip to Kenya in 2016), this time opting for a Jeep instead of a walking stick! An unusual morning of pouring rain made for a soggy and late start, but with spirits high (albeit a bit damp), we soldiered on to find that the animals were, in fact, out in full force, enjoying the cooler air and puddles that had formed in the fields. Along with a better understanding of how the country has been protecting these now thriving elephants, we also got to know our host, who shared his inspired and lesson-filled story of overcoming the odds to become a successful tourism entrepreneur. Needless to say, after our short visit to Udawalawe, we left encouraged and hopeful for both the people - and the animals - of the southern Sri Lankan plains. Safari in Udawalawe National Park brought us up close to the magnificent Sri Lankan elephants (Dec 20). Peacocks were hang drying their feathers on this soggy morning. A peacock’s royal plumage was truly something to behold in the wild. A herd of Sri Lankan Elephants, the mothers and aunts surrounded the calves for protection. Our jeep managed to get stuck in the mud – thank goodness for helpful guides throughout the park! This beautiful Grey Langur Monkey waited out the rain from her perch. 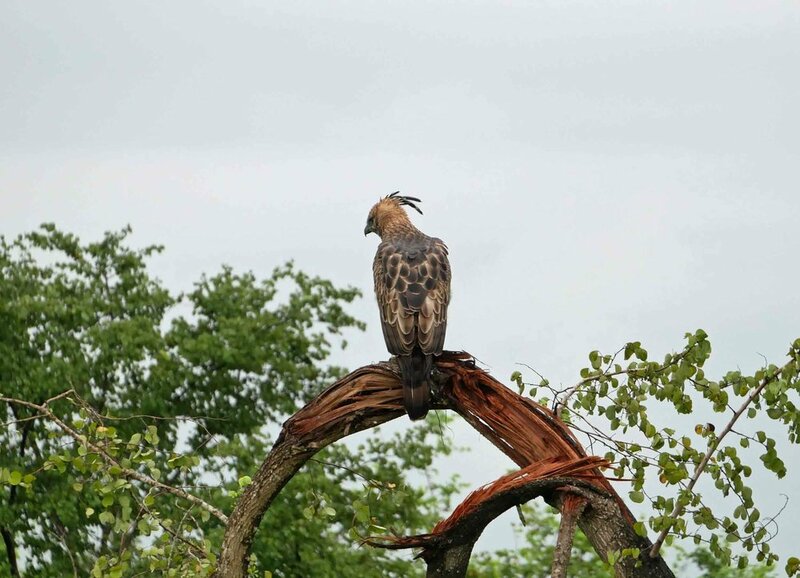 A Crested Hawk Eagle perched high atop the canopy as it scanned for prey. Peacock reflecting on life in the Sri Lankan plains. What’s that you see, Trey? Another eagle! This time we spotted a Changeable Hawk Eagle. A Sri Lankan elephant dug in the clay soil for minerals to consume. It was a chilly, damp morning, so we made sure to bundle up! Water buffalo were curious of our Jeep. 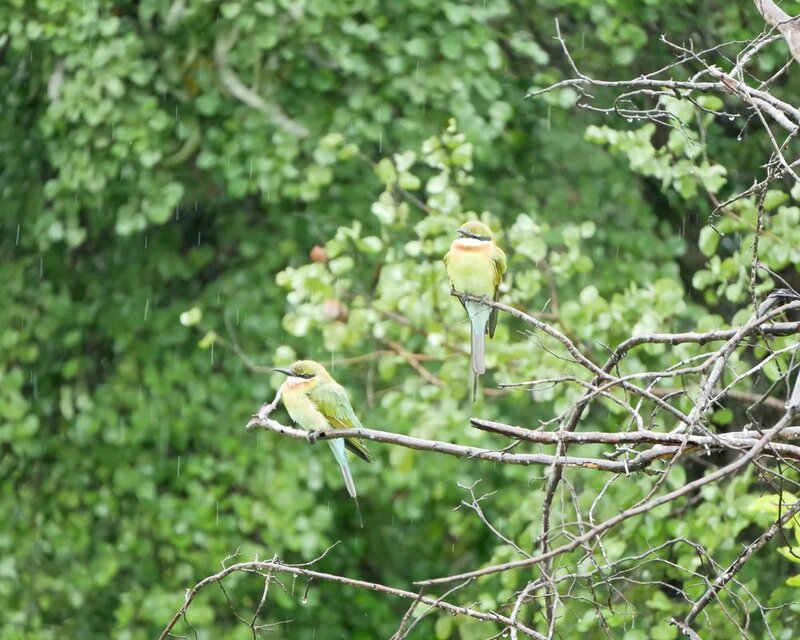 The beautiful Indian Roller birds were numerous in the park and playful in the rain. A white bellied sea eagle scanned the waters from high in the trees. A herd of water buffalo were completely in their element. A small herd of Sri Lankan Sambar Deer grazed in a meadow. A pair of toque macaque monkeys were caught off guard! Elephants use mud to coat their bodies for protection from the sun and insects - so all the rain was like a spa day for them! The next morning, we swung clockwise around the bottom of the island through lush rice terraces to reach charming Galle, which was originally settled by the Portuguese in the 16th century and later extensively fortified by the Dutch. A UNESCO World Heritage Site, Galle Fort is not only an impressive example of a Portuguese fort city but also one of the largest remaining European fortresses in all of Asia. Today, it serves foreign interests in a very different way, namely as a tourist magnet and hub for holiday-goers on the west coast. In our rented loft-style apartment within the Fort’s interior, we made a home for several days, happy to once again have space (over three narrow floors, how Dutch!) and privacy after many weeks in guesthouses and hotels. We caught up on writing, spent time exploring the shops and cafés along the town's cobbled streets, drank many cups of coffee (and our recently procured teas), and took sunset walks along the Fort’s coastal perimeter, soaking up the warm sun and shimmering sea below. The charming lighthouse of Galle, flanked by swaying palms in the tropical heat (Dec 22). Beautiful Dutch colonial heritage architecture can be found around the Fort village of Galle - including this historic mosque. We enjoyed the perfectly clear days until the midday sun would drive us indoors! 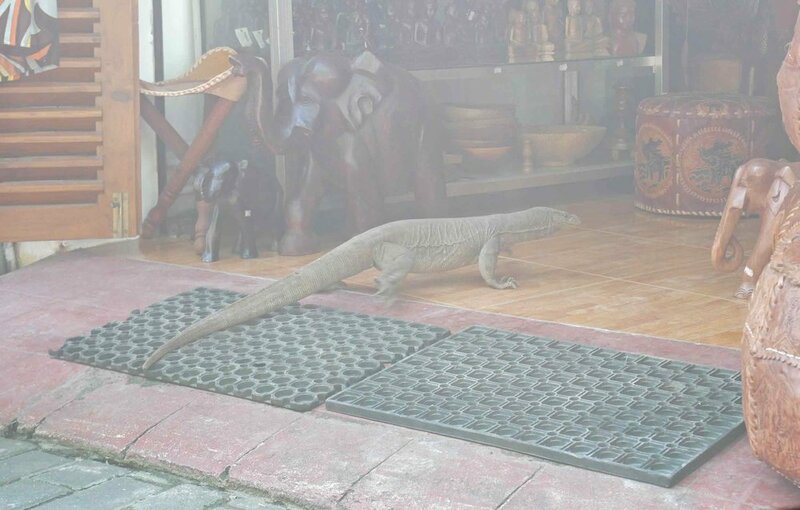 A monitor lizard decided to have a browse in a local shop. The golden hour was soon upon us in Galle, and this clock tower was begging to be photographed! Finally, it was the last week of December, which meant we’d also come to the very last stop of our yearlong journey, a quintessential Sri Lankan scene on Talalla Bay Beach. Arriving on Christmas Eve, we admired the long, curved coastline bookended by craggy cliffs and dotted with swaying palms, but mostly, we appreciated the lack of development, only a few resorts and restaurants were hidden where the jungle growth met the sand. And while this stretch of beach has had an undeniable allure on tourists – in fact, it was recommended it to us by friends (thank you, Rhys!) who’ve cleansed at the local Ayurvedic resort for several years going –, we often had the tranquil beach to ourselves as we took long walks beside the crashing waves. Our guesthouse was owned by a welcoming Australian family, and for this last week of the year (and our journey), we lived like spoiled kings with their kind and gracious hospitality providing everything we needed, including big, beautiful breakfasts of fresh fruit and buffalo curd, spicy omelets and rich coffee. As we sat on our third floor balcony overlooking the unending expanse of the Indian Ocean, we found ourselves in many quiet, beautiful moments of awe as we took in the limitlessness of the horizon and offered gratitude for all that has been given to us, all that we have learned and experienced over this past year, and all that we hope to give back in our journey. Feeling so grateful after a year on the road (Dec 26). We couldn’t get enough of scene, the last beach of the journey in 2017! Trey showing off some of his yoga skills learned on the road this year. Each day, we enjoyed fresh seafood that had been brought in before we had even awakened (Dec 28). Martin takes one last plunge of 2017 - and of our journey (Dec 30).